The gastrointestinal system, commonly referred to as the gut, plays a major role in the health and wellbeing of the entire body. While the primary role of the digestive system is the breakdown and absorption of nutrients, the gut also serves as a communication center for the brain, and is home to the microbiome, a diverse community of flora that plays a vital role in fighting disease and maintaining health. Digestion is one of the most critical and energy consuming functions of the human body. Energy is utilized for the mechanical and chemical breakdown of food for assimilation of vitamins and nutrients, and for the movement of food throughout the entire 30-foot-long digestive tract. Complete digestion of an average meal varies between individuals and between men and women. In general, it takes about six to eight hours for food to pass through the stomach and the small intestine. An additional day or two furthers digestion and water absorption in the large intestine before waste is eliminated. As different foods are processed at different rates, its likely our bodies are in a constant state of digestion. Is it any wonder then, that most of us experience uncomfortable digestive issues on occasion? The inability to completely digest foods can lead to uncomfortable digestive symptoms such as bloating, gas, abdominal pain and problems with elimination. For some, this can be a sign of a serious underlying medical condition, such as Crohn’s disease, celiac disease or exocrine pancreatic insufficiency (EPI). For many others stress, low-grade inflammation, infections, allergies, dysbiosis, food intolerances, poor diet, or simply aging may lead to improper digestion and nutrient malabsorption. Essential for whole body wellness, a properly working digestive system allows food to be broken down into small, usable molecules for complete nutrient absorption without intestinal discomfort. By some estimates, more than 100 million Americans appear to have digestive issues that impact their ability to properly digest their food, preventing adequate nutrient assimilation. In order to break down food effectively and efficiently, a sufficient supply of digestive enzymes is necessary. Enzymes are specialized proteins that function as catalysts, accelerating the rate of metabolic processes and cellular reactions, including digestion and metabolism. Specific digestive enzymes produced by the stomach, pancreas, small intestine and salivary glands, target particular molecules in foods. These enzymes break down proteins into amino acids, fats into fatty acids and glycerol and starches and sugars into glucose; they address other components such as gluten and casein as well. 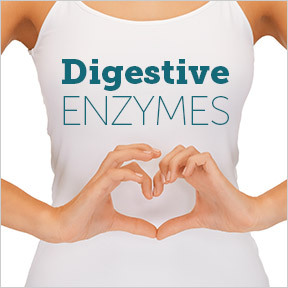 When digestive enzymes are in short supply, the body cannot fully digest and absorb the nutrients contained in food. It’s clear that poor diet, unbalanced gastrointestinal flora and reduced digestive enzymes can wreak havoc on both the digestive and immune systems. Ideally, our bodies should be able to produce the enzymes we need. However, factors such as leaky gut, inflammation, food sensitivities, toxins, chronic stress, genetics and aging can all lead to inadequacies in digestive enzymes. Although foods, especially vegetables and fruits, contain enzymes needed for healthy digestion, cooking, processing and preserving diminishes nutrients and destroys naturally occurring enzymes. Chronic stress is a very common reason for digestive enzyme deficiency, as it keeps our bodies in “fight or flight” mode as opposed to “rest and digest” mode, which means digestive function is minimalized. With aging, we often have reduced amounts of gastric, pancreatic and other digestive system secretions. 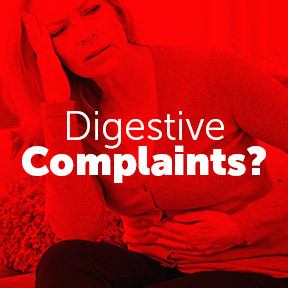 Those who frequently seek relief from OTC medications for symptoms such as heartburn, acid reflux, bloating, gas, or poor elimination may not realize that their digestive distress is often the result of impaired digestion. Contrarily, digestive enzymes can minimize digestive distress, lower the amount of energy needed to transform the foods we ingest into small absorbable molecules and maximize nutritional absorption. To support optimal health and wellness, eat a high fiber, low processed food diet, reduce and manage stress, stay active, and maintain a healthy gut. Supplementing with high quality, well-researched digestive enzymes can play a key role in working with the body’s own natural processes to fortify digestive health and optimize overall wellbeing. Digest Gold® with ATPro by Enzymedica: This top selling, potent digestive enzyme formula assists in the digestion of proteins, fats, carbohydrates and fibers. Digest Gold® is designed and recommended for individuals who want to fully benefit from the nutrients they consume, decrease the amount of energy the body uses for digestion, increase metabolic enzyme potential and support all bodily functions. Gluten, wheat, soy, dairy, yeast, preservative and artificial ingredient free, Non-GMO, kosher vegetarian formulation. Full Spectrum Digestion by Theramedix: This professional formulation provides a broad range of digestive enzymes selected for their ability to breakdown and absorb carbohydrates, proteins, fats, and fibers within the varying pH levels of the digestive tract. This product is Non-GMO and vegetarian, and contains no fillers, artificial ingredients, or preservatives. Pancreatin 10X Ultra by Professional Complementary Health Formulas: This professional pH sensitive specialty nutrition formula provides high potency, naturally occurring, porcine sourced pancreatic enzymes for enhanced digestion and assimilation of proteins, fats, and carbohydrates.